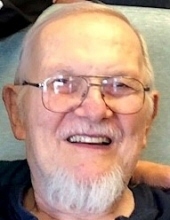 Leroy A Holm, 81, of Philadelphia, passed away at 11:45AM Sunday, February 10, 2019, at Sunset Home in Quincy, IL. A graveside service with full military rites by Boots-Dickson Post #174, will be at 2PM Saturday, February 16th, 2019 at Greenmount Cemetery in Quincy, IL. Leroy was born November 12, 1937, in Quincy, IL. to H.A. Walter Holm and Lillian (Durk) Holm . He married Cindy Copenhaver on July 8th, 1989. She survives. Other survivors include daughters, Kathy Dancer, Susie Maas (Larry), Jeanne Allen, Sharon Labroo, all of Quincy. Amy Drescher (Jay) of Franklin TN and Amber McLeod of Palmyra, MO, and son James McLeod of Palmyra, MO, his sisters, Joyce Brewington (Robert)of Smithfield, NC. Judy Gragg of Quincy, IL and brother, Delbert Holm, also of Quincy, IL. Grandchildren Sam Dancer (Jennifer) and Max Dancer, Lindsay Cruz (Eric), Jacob Maas (Shelby), Zachary Maas (Stephanie), Brandy Cottrell (James), Marlee, Andy, and Erik Labroo, Joe Drescher, Madeline Boswell (Jack), Taylor Galadyk (Matt), Austin, CJ, James, and Jerid McCleod as well as seven great-grandchildren with two more expected in the spring, and his numerous nieces, nephews and extended family. Leroy was preceded in death by his parents, H.A. Walter Holm and his wife Lillian. He attended St. James Lutheran School and graduated from Quincy High School. Lee achieved the rank of Major in the Illinois National Guard and retired after 20 years of service. He began his trade after high school in the machine shop and then as an apprentice machine/pattern maker alongside his dad at Gardner Denver. Leroy co-owned Sass Brothers until 1983 and retired from Midwest Pattern and Machine in 2000. His many hobbies included hunting, fishing, shooting and he cherished spending time with his kids and grandchildren. Leroy was of Christian Faith. To send flowers or a remembrance gift to the family of Leroy A Holm, please visit our Tribute Store. "Email Address" would like to share the life celebration of Leroy A Holm. Click on the "link" to go to share a favorite memory or leave a condolence message for the family.